Today I started making a batch of about 23 Liters (32 bottles of wine) of a blackcurrant and apple rose wine. It is the intention to ferment all the sugars and produce a dry Rose. The juice was extracted from the fruit, filtered and purified with potassium metabisulphite and then fermented, not on must, but directly with the juice. The PH was adjusted to 3.1 by adding a combination of citric and tartaric acids, using the titration method to determine PH as it is more accurate. After measuring the specific gravity with a hydrometer, it was adjusted to a level of 1090 by adding sugar, which, if all fermented, should produce a wine of about 12 % alcohol. Starting with 2 to 3 liters more than the main vat can take gives you product to top up with, from time to time, after racking and filtering. This smaller quantity is fermented in a separate smaller jar (5 Liters) until used. Red wine yeast and nutrients were added and fermentation traps fitted and the long process of fermenting, racking, clearing and filtering started, to hopefully bottle in about four months time when the specific gravity has reached a level of less than 1000. 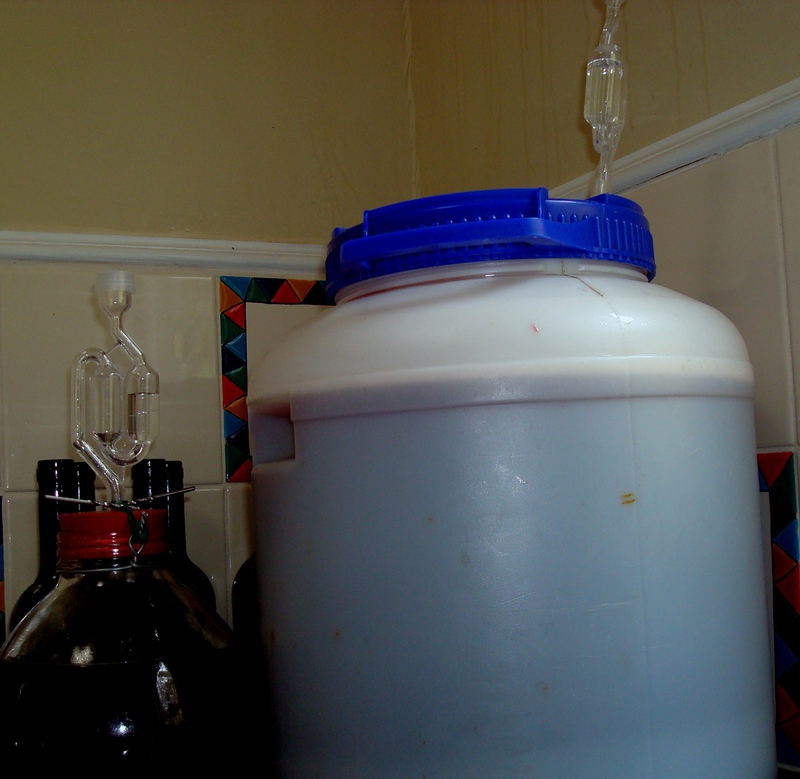 I rack and filter more frequent than normal, as I like a clear clean drinking wine. This should be a very palatable dry table wine, light red or rose in colour with very little sweetness, a good nose, clean taste and medium body, which is the way I like my lunch time wine. Always a first in live !